Could Free Transit Lure Germans From Their Cars? : The Two-Way The proposed no-fare program would begin in five cities, as Germany endeavors to meet EU air pollution targets. But similar plans haven't always worked as hoped. To meet EU air pollution targets, Germany may make public transit free in cities struggling with poor air quality. 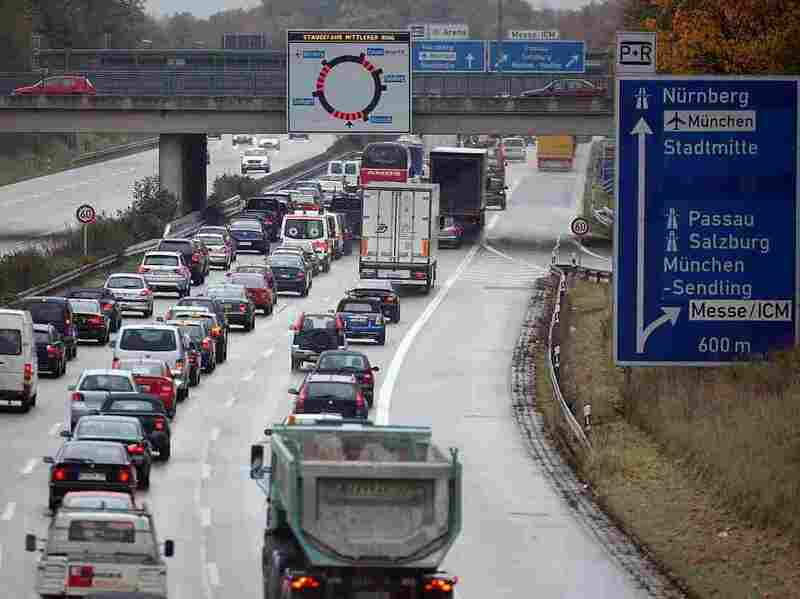 Here, a Munich traffic jam in 2007. Germany is considering free public transit in its cities in order to curb car use, as it hurries to meet the European Union's requirements for air quality. That proposal is put forth in a letter to from the German government to the EU's Environment Commissioner. The free transit plan is part of a range of measures suggested in the letter, including low emission zones, incentives for electric cars, and technically retrofitting existing vehicles, Reuters reports. "We are considering public transport free of charge in order to reduce the number of private cars," the letter says, according to Agence France Presse. "Effectively fighting air pollution without any further unnecessary delays is of the highest priority for Germany." Germany and eight other EU countries missed a January 30 deadline to meet the EU's air pollution limits. If they don't offer convincing plans to meet the pollution targets, the countries could face legal action at the European Court of Justice.
" 'Life-threatening' pollution affects more than 130 cities in Europe, according to the Commission, causing some 400,000 deaths and costing 20 billion euros ($24.7 billion) in health spending per year in the bloc," AFP reports. And getting some Germans to leave their cars at home may be difficult. After all, this is the home of Volkswagen, BMW, Daimler — and the autobahn. The free transit scheme would start in five cities, according to Deutsche Welle: Bonn, Essen, Mannheim, Reutlingen and Herrenberg. The EU introduced limits on the levels of particulate matter and nitrogen dioxide in 2010, the broadcaster explains. But many cities regularly exceed these levels – including Stuttgart, which has recorded particulate levels over twice the limit. Diesel cars are considered the primary culprit for high nitrogen oxide levels in Germany and France. Diesel trucks are already outfitted with diesel-scrubbing systems, unlike diesel cars. For years, some European governments have offered tax breaks on diesel fuel. In 2016, Germany's tax breaks for diesel came to $9.2 billion. "But diesel began to lose popularity after studies by the governments of France, Germany and Britain showed that the diesel cars from almost all manufacturers polluted much more than advertised. Though only Volkswagen has been accused of criminal behavior, many others exploited weak enforcement and loopholes in regulations. As a result, European cities like Madrid or Athens often have unhealthy levels of nitrogen oxides, which can cause asthma and lung cancer. "The decline in diesel's market share has accelerated this year after cities like London, concerned about nitrogen oxide pollution, began taking steps to keep diesels out of city centers. Diesel vehicles produce far more nitrogen oxides than their gasoline-powered counterparts." While it's evident that many German cities have polluted air, it's not clear that eliminating transit fares will make much of a difference. A key question is whether free transit actually gets people out of their cars – or whether it primarily entices people who would normally walk or bike to take the train instead. That's what happened in Tallinn, Estonia, which began providing free transit to its residents in 2013. A study found that making transit free has improved mobility for low-income people in the city, and is responsible for a 14 percent increase in people taking transit. But that increase largely came from people who used to walk. Other cities have made transit free temporarily during periods of severe pollution. In 2014, Paris made transit free for three days, along with its bikeshare and one-hour sessions for electric carshare. Two years later, Paris went a step further and banned cars with odd or even license plate numbers in an effort to emerge from its blanket of smog. The German transit systems would likely need to add capacity for more riders. "It doesn't make sense to use more diesel buses of course," a spokeswoman for the city of Bonn told DW, explaining that the federal government had given little information about how the plan would work. "We don't know of any manufacturer that would be able to deliver so many electric buses on such short notice."